TBG client high beauty (“high”) is as hot as can be. The collection is set to debut in November at Sephora.com & soon thereafter in all doors of the beauty emporium. 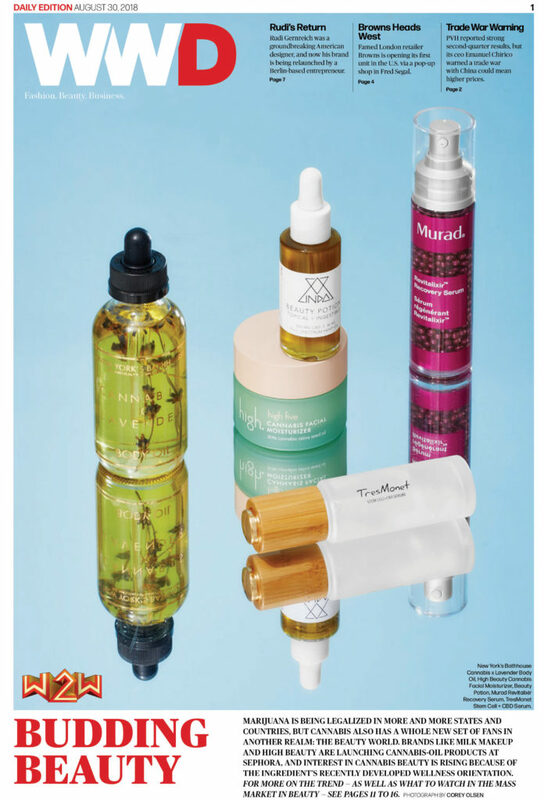 WWD, however, featured the “high five”, Cannabis Facial Moisturizer on the cover of its Daily Edition for August 30th. Formulator & company founder Melissa Jochim has just begun with this new line of products. The line currently has two products, the “high five” Moisturizer & the “high expectations” Facial Oil, she has plans for 4 or 5 others to complete the range & rumor has it, they are already in the lab being formulated. The entire high beauty collection utilizes the power of Cannabis Sativa seed oils & extracts to achieve its miracle results… fully legal & fully incredible!